Summer in Kruger. Impala babies, the rains green up the bush again. There are a few things that landmark the true start of summer for me. The arrivals of the Woodlands kingfisher and the cuckoo’s, the start of the rainy season with that gorgeous, earthy smell (which also brings out the red romans that freak me out) and of course the impala lambing! I have already heard the typical call of the Diedericks cuckoo and the Klaas’s cuckoo but not the Woodlands yet. Although a friend just heard one close to Phalaborwa, which means they are on their way! I saw the first report about impala lambs being born in one of my Facebook groups on Monday! Apparently, the babies were seen close to Pretoriuskop. I love impala babies. They are the cutest things on the planet, so yesterday morning I packed the boys in the car and set off to try and find some baby cuteness in our area. I never got to see any babies though. A mere 3 kilometres from home I saw a few cars parked on the left-hand side. There was a big male impala hanging high up in a tree. This could only be a leopard’s kill! I imagined the leopard was probably not far. There was still a couple of impala around and all of a sudden they started snorting in alarm! I looked through my binoculars in the direction the impala were looking and eventually managed to find the leopard! He was extremely well hidden! I hoped that the leopard would eventually get back up the tree to feed some more, so I switched the car off and decided to wait. The leopard was so well hidden. At first, I could only see spots! Alex and Jack could not see the leopard at all and they were soon getting a bit bored. That is why lollipops were invented! To keep your kids entertained at a sighting;-)) Alex made me laugh. While I was trying to explain to other people where the leopard was, he was waving at all the cars coming past telling them he saw a “nijlpaard”. Which is Dutch for hippo. Leopard is “luipaard” and he obviously got the two animals mixed up and lost in translation. The leopard with his kill high up in the tree. Eventually, our patience was rewarded and the leopard showed his beautiful self while he climbed back up the tree. After a few precious moments watching this magnificent animal feed on his kill, we went home. We will recommence our search for the impala lambs later today! Have a lovely summer everyone!! Love the pic of the zebra amongst the flowers! 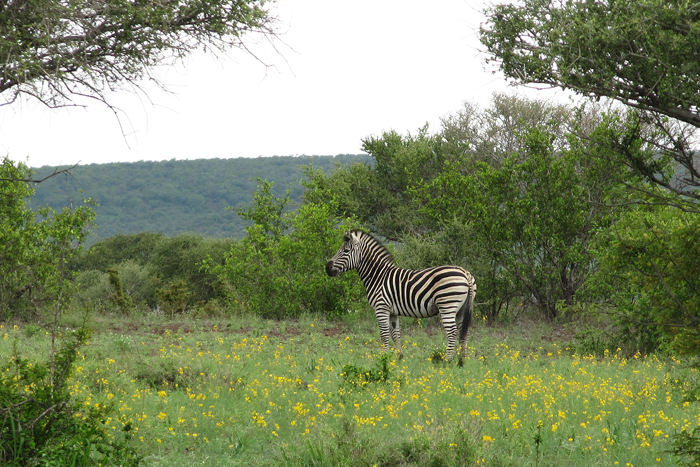 I remember many years ago a ranger telling me that his favourite sighting was zebras amongst the flowers on a grassy plain in spring. I always look out for it but as we go to KNP in May/June we dont see many spring flowers. However one June not long ago, the grass around Tihongonyeni was a mass of yellow flowers of some sort and a few old daga boys ploughed their way through. Very funny to see a big grouchy old buffalo with a yellow flower hanging out of the cornerof its mouth! I agree! There is something very special about seeing animals in a field of flowers. Around Tihongonyeni it might also have been those wild cleome’s you found. Haha, I had to laugh at the visual image of the buffalo wading through these gentle flowers! That must have been a very funny sight! The impala lambs always remind me of little girls who have had lessons on how to get their makeup as perfect as mommy’s!! I love your refreshing stories. So well told. I would love to see the impala babies – maybe next year. Your sons will have wonderful memories of their early years. Thank you, Janet! I hope so! Nijlpaard,😂 make me think of my children when they where young, but they done it on purpose. Haha, I can’t blame them!!! I am sure that is a fun ‘game’ to play for kids;-) So was Liza naughty that way too growing up? lol! Your usual day is so surreal to me. Just wow. I really like Impalas. They “feed” predators to keep them alive, they have so beautiful eyes. Thank you, Marek! Yes, impala’s are gorgeous! Even if you don’t see anything at all on a game drive, you can always rely on them to be there! I love the creches once all the babies are born. Cuteness overload. Thank you, Helen! I hope you get to go visit Kruger again soon!